Some brand new photos from the upcoming Tomb Raider reboot have just arrived online. Looking ahead to 2018, there's a lot to be excited about, especially in terms of movies with a lot of potential. One of those movies might, dare we say, break the Hollywood curse and give us a good video game movie. Not necessarily great, but at least good. It's a little too early to tell, but this latest batch of photos from Tomb Raider look very faithful to the source material, with some serious intensity from Alicia Vikander. 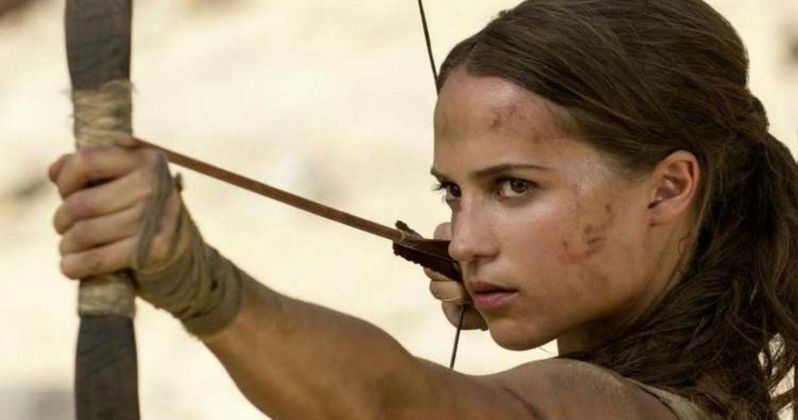 As we've seen in previous photos, this version of Lara Croft, played by Oscar-winner Alicia Vikander, is going to be using her bow and arrow, which she has at her ready in this latest sneak peak. We also see her with a flashlight in a dank, dark space. A tomb perhaps? There's also a shot of her looking at something rather uneasy. Possibly a death-defying stunt she must pull off to save her life. One of the really cool new shots is from behind-the-scenes, as we see filming taking place during the sequence where Lara Croft jumps from the breaking plane wing, which was featured in the trailer. The Tomb Raider games have been going strong since 1996, but this new movie version is going to be taking its inspiration from the most recent series of games. The 2013 game, simply titled Tomb Raider, tells Lara Croft's origin story and sold more than 5 million copies worldwide. So people really liked it and it's easy to see why that would seem like a logical take for the movie. The last trailer was almost shot-for-shot sequences pulled from the game, so those worried that this isn't going to be faithful in that sense probably shouldn't be concerned. In addition to Alicia Vikander in the lead role, the movie also stars Dominic West (Money Monster), Walton Goggins (The Hateful Eight), Nick Frost (Shaun of the Dead) and Daniel Wu (Into the Badlands), who's also featured in these new photos. Warner Bros. has tapped Roar Uthaug (The Wave) to direct the Tomb Raider reboot, which is set for release on March 16, 2018. This marks his first major blockbuster for a Hollywood studio. If this first one goes well, this is no doubt being eyed as a franchise, which could open up a lot of doors for him in the future. Then again, history tells us that Tomb Raider is something you shouldn't get your hopes up too high for. Somehow, Hollywood still hasn't made a great, or even generally good video game movie. Movies like Assassin's Creed, despite having a boatload of talent on board, still couldn't come together in a satisfying way. Still, Tomb Raider seems to have a lot of the right pieces in place. The question is, will they come together and be the movie we want it to be? At the very least, hopefully it's better than the Angelina Jolie Tomb Raider movies. Be sure to check out the new photos from Tomb Raider, courtesy of Games Radar, for yourself below.